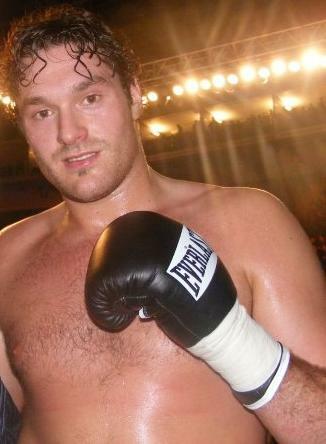 British heavyweight Boxer. He has claimed a few times "I'm 6ft 9" and "18 stones", although as an amateur he was billed as 6ft 7. He has also been billed in 2018 as 6ft 8 3/4. Tyson Fury is 6 foot 8 , David Price is 6 foot 8 , Deontay Wilder is 6'6.5" . Anthony Joshua is 6'5.75"
I think the difference between Wlad and Fury is 2.5 inches. @ Thomas Roberto - I think for morning heights your guesses are probably quite accurate. Wladimir himself has reportedly mentioned that 6'6" is a morning height. Fury can look about 2.5 inches taller at times when Wladimir wasn't in lifts. Tyson Fury to me is around 6 foot 8 and 1/2 inches. If Wilder is 6 foot 7 and Wlad is around 6 foot 6, I think it's fair to say that he has the height advantage over both of them. Here Fury is next to Wlad at a presser. He's looking at least 6 foot 8 .5 or 6 foot 9. I have whatch tyson a number of times against other guys and i would definately say he was a good ft6,9. Because he was a few on wladimir and wladimir had to box upwsrds and take chances like he hadn,t before. If you look at the 2 face to face you would say for sure tyson is no less than ft6,8. @JD1996 - I agree he drops height a lot with posture. I spent a long time trying to explain that to people before the Wilder fight, but people didn't really accept it until they saw them in the ring in boxing footwear. I think the worst case for Fury is a strong 6'7" but I can also envision the possibility of him straightening up to a weak 6'8". In any event, I think Rob's 6'7.5" listing can't be far off (for later and the day and barefoot). I think if he stood with better posture he would surprise people with how tall he actually is, i think in his usual slumpy posture looks about 6'7" but if he stood properly he would be 6'8" or very close to it. One of my friends is an example of this, he can often look barely 6'4" but when when he stands properly it's clear he's at least 6'5" same situation for fury I would say. 79.75-80 inches tall evening imo, not 6'9" barefoot probably at or near it in shoes though. He's noticeably taller than wilder about 1 3/4 inches. @Crane - For Fury I think his looking taller than Alex Ustinov and Scott Belshaw, close to Wach's height (with thinner footwear) , and appearing something in the neighborhood of an inch and a half taller than Wilder in the ring and press conference makes over a flat 6'7" in my book. But I do think David Price is the taller of the two. @Crane: wilder is 6’6 and so is Joshua 6’5.5-6’6” he’s not as low as 6’5” next to Rob. But for Fury I have him about what you said 6’7.25 and 6’8” out of bed. @Canson Fury was never 6'8.. In fact, he was not even 6'7.5. Fury real height, when he made his Boxing debut was 6'7 then later changed to 6'9 and then down to 6'8. The same goes for 6'6 Deontay Wilder and 6'5 Anthony Joshua. The only true 6'8 Boxer is David Price. It is a very specific figure for him, worth mentioning, I forgot to do that when it was talked about at the time of that match. @movieguy12 If you meant me as the poster who suggested 6'6" - I didn't mean to suggest Tyson was only that height. I only thought he looked 6'6" in the one of photos next to Patrick and that he looked 6'8" in the other photo from the mobile phone. As for what he'd actually measure - I think worst case scenario for Fury is a strong 6'7". I could picture him measuring closer to 6'8" too honestly. He has pretty lax posture a lot of the time, and can look shorter than he'd actually measure. Great job by Mickie to work up the comparisons. The only thing I am sure of is that Fury is between 6'7 and 6'8. He is not a guy I can settle on a single height with - the jury is still out. Hopefully we will see him facing off with Joshua sometime soon..
Great photos from Patrick Whelan. It is strange how the difference looks noticeably greater in the mobile than pro photo as Patrick himself says. There is no way Fury is only 6'6'' though as possibly suggested by another poster. The minimum I'd go with if the 6'7.5'' height given on this page. Fury might not be taller than this but he isn't shorter either. Each big man looks like they're not standing quite at full height in the pics. I'd say Nash "appears" 202 cm range in the pictures if you don't account for posture, and Fury "appears" around 202.5 - 203 cm in the first and perhaps 198 cm in the second. He only looks 6'6" to me there, even though I see more 6'8"-ish in the first. I do think Nash measures over 6'8" standing straight. Yeah, Fury looks taller in the mobile picture than the pro one. I can see 6'8"-ish in the mobile one but not in the pro one. I just uploaded that photo Here. The small version was the one you had sent, it looked like a thumbnail version that got sent...but you could still tell there was a difference in his height between the 2 different angles. @ Patrick Whalen - is your twitter pic you and Tyson? Because if it is I think I saw it. I'd like to see Rob create one of those side by side photos comparing your photo along side his own photo with Kevin Nash. @184guy2 - I don't think he's quite 6'8" later in the day, but I think he could be very close to that. He doesn't stand well much of the time, which makes people think he's shorter than he really is. I wouldn't rule out something like 6'7.75". He was distinctly taller than Wilder when both were in boxing shoes. The estimate would depend on how tall you think Wilder is. Fury is more than one inch taller but less than two inches, in my opinion. @Mickie: I think he’s at least 6’7” probably more 6’7.25 actually. Maybe Vitaly Klitschko would be weak 6’7” however. What sticks in my mind is that Wlad (sneakers) was able to match Fury (barefoot) for height, I imagine Wlad had orthodics or a lift in those sneakers. Still, Wlad 6'5.25 + 2 inches = 6'7.25. That is what Fury seemed on that day. I do believe 6'5.5 is possible for Wlad but still, I can't quite figure Fury out. For me, Wlad and Vitali are about 3 cm apart. I think Vitali is 6'6.5". This mean's Wilder is 6'6.5" and Fury is minimum 6'7.5" and could be 6'8". Vitali at 6'6.75" is good with me. I think it has to be either 6'6.75" or 6'6.5" for him. I don't think he's quite the full 6'7" but I do think he's very close. Vitali looked 6 foot 7 the full thing next to Odam for sure. But pictures can be deciving.Odam is probably just under 6 foot 9 barefoot. Vitali could be 6'6.5", but I wouldn't go under that though. He looked pretty tall next to Lamar Odom. Vitali at 6'6.5" or 6'6.75" would make sense to me. If Wlad really is 6'5.25, perhaps Vitali is 6'6.25, I always thought there was only about an inch or inch and a quarter between them. I'm not sure about downgrading Wilder. He went back to back with Vitali Klitschko and was the same height. Vitali looks 6'7''. Also his brother Wlad has said in a comparison between Wilder and Joshua that Wilder is taller. Again how tall is Fury actually? OK the 6'9'' seems slightly inflated but is he only a little shorter than this which would mean Wilder could still be 6'7'' or so. Could be fury 6'7.75" if wilder is 6'6" flat I guess, and yeah wilder is probably a touch smaller than melo in the picture even if there is a slight advantage in his favour I suppose. I can see Wilder 6'6 flat and Fury 6'7.25. I still believe 1.5 inches represents their max height difference. There are still numerous photographic examples of a 1 to 1.25 inch height difference. I can definitely agree with Canson - Rob, time to downgrade Wilder a tad to 6’6” flat? Then Fury at 6’7.5” makes sense. I agree with Canson 100%. He looks 1.5 inches taller minimum than wilder I would say closer to 2. @Mickie: I doubt that high out of bed. I do agree probably a full inch tho for someone his size. I would go with 6’8.25 out of bed or between 6’8-6’8.25 then 6’7-6’7.25 for the low. That’s kinda like Lebron when people refer to him as 6’9” although I have Lebron as a solid 6’7” max but Fury would be probably weak 6’8 in the morning after an hour or two when he would be measured making him 6’8.5-6’8.75 with shoes then. But I won’t rule out closer to 6’7.5 and 6’8.5 either since the listing and since he had a pronounced advantage on Wilder. I'd say a worst case scenario for Tyson would be about where Canson has him, a strong 201 cm. But personally after seeing the Wilder fight and build up, it's got me thinking that the 6'8.75" he's been listed at might well be his out of bed height. I just thought he looked a good inch and a half taller than Wilder, who I see as being 6'7"+ out of bed. If Fury is 6'8.75" first thing in the morning, I think that'd suggest a weak 6'8" for his afternoon height (he's such a big guy, I'd imagine he'd lose at least a full inch). If Tyson is really 202 cm or less, I think Deontay Wilder's 6'6.5" listing needs to be brought down. If I was Rob, I would consider listing Tyson a fraction higher and/or Wilder a fraction lower. Tyson Fury stands no more than 6'9" after sleeping for 12 hours . After a long day of work he can't be under 6'8" , as a human being loses about 1 percent of his height throughout the day . Conclusion : Nothing under 6'8" makes sense , I thinks everyone agrees that Wilder is at least 6'6.5" at night and 6'7" when he wakes up . The height difference between these two men are not more than 2 inches , it can not be ! To me he seems to be around 6'8"
I think Tyson has Wilder by a solid inch and a half. The more I look at it, the more I can understand the difference being nearly 2". But I'll still go with 1.5" for the time being. I think that's fair. When Tyson doesn't stand tall, they can look much closer in height. He drops a lot of height at times. JD1996, I believe Tyson is tip-toeing in your photo, their height difference is not quite that much. It's about 1.25 to 1.5 inches imho. It could be 6'6.25 Wilder and 6'7.5 Tyson. @ Will - his wife was saying he was 6'7" at age 16, not now. Click Here The difference betweeen wilder and fury seems around 5 cm to me, whatever wilder is fury is about 5 cm taller. Wilder could be 6'5.75" I'm not really sure on his actual height tbh looks about an inch taller than wladimir klitschko does. It's more than an inch between the two fighters. @ Christian - I used to think the difference was 2 to 3 cm also, but my mind changed after the final press conference, weigh in, and most of all seeing them in the ring. Having seen them both in scant footwear like boxing shoes I think the difference is more like 1.25" - 1.75" range instead. About an inch and a half give or take. Can't see just an inch. I don't think Tyson would be happy to hear that from his beloved! 3cm difference is the max. 2.5cm is possible as well, putting Fury at 6'7" flat. Looked enormous on SPOTY last night. Dwarfed Gary Lineker. It’s at times like that when he can look a believable 6’9”. Not saying he is, but he can look it. @184guy2 - Fury had no footwear advantage over Wilder nor tip toed in the ring. But Fury still was 1.5" taller than Wilder. Btw I thought he had an easy 2" on Joe Joyce, although Joyce's hairstyle leaves some reasonable room for debate. Generally in all pics Fury had the footwear advantage over Wilder. Other thing , Fury usually tip toeing agains his oponents to look even taller. Fury struggles to looks over 6'7 with 6'5.5 listed Joe Joyce in same footwear and similarly posture . Fury looks to be the same height as price or at most 1 cm shorter Click Here and fury honestly looks around 1.75-2 inches taller that deontay wilder who is an inch or up to 3 cm on vlad Click Here. Also fury looks a good couple of inches taller than Deontay in this photo which shows them both from above it's clear the top of furys head come a couple inches higher Click Here. I think wladimir 6'5.25", deontay 6'6.25-5", and Tyson fury 6'8" maybe a hair more or less. @184 guy: I think he could have 1.25” on him which is roughly 3cm. But no higher. A 6’6” Wilder puts Fury 6’7.25 still. Fury was only a tad shorter than Price if not even the same height as Price in the airport picture in 2014 when Fury was in better shape . It was only with the weigh gain in 2017 and his poor posture effected his height. Fury posture is not very good so he is rarely standing straight. Anything under 202cm is just too low. @184guy2 - Did you see them at the weigh in and in the ring? Fury had more than an inch on Wilder. The question is whether Fury is a bit taller than he's listed or if Wilder is a bit shorter than he's listed. I do get it with Fury, thinking he's shorter than he really is. He drops height in photos a lot. But next to Wilder in the weigh in and in the ring, Fury is something like an inch and a half taller, rather than the same height as Wilder like some observers thought. @ JD1996 - Yeah I wouldn't rule that out either. @Mickie: funny thing is I thought Afrojack was 6’7+ before but today I see that he isn’t any taller than someone like Lebron if he’s even as tall as he is. I could see as low as 6’6.5 for him at times then 6’7” at other times at a push. The 6'8.75 measurement is very likely his height in running/athletic sneakers. @ Canson - you could be right about the tallest and shortest of the 4. I should've also mentioned Afrojack could be included in that club of billed 6'9" + guys who Rob has sub 6'8". I think he'd be the shortest if he was included. I believe that height seems like it could be either a morning height or a height in shoes. My bet would be on Hafthor, just because Rob met him and estimated him at 6'7.75", although he looks 6'7.25" next to him though, so it's hard to say. I think Magic would be the shortest out the 4 though. After all the dust has settled, I think 6'6.25 Wilder and 6'7.5 Fury. I wonder who is the tallest to shortest between: Tyson Fury, Kevin Love, Hafthor Julius Bjornsson, and Magic Johnson (peak). All these guys who have been listed at 6'9" or taller in some sources. If a 5'8" man can shrink almost 2cm throughout the day then I can believe around 6'9" for Fury straight out of bed, although later in the day below 6'8" looks more likely. I feel like fury had closer to 2 inches on wilder, fury is probably 6 ft 8-.25 give or take, he was noticeably taller by more than just an inch! @Christian 6'5 3/8: I agree that Wilder needs a downgrade, but 6'6 flat is a bit low, same for Fury, Fury looked a good bit taller than Wilder, what I mean by that is in all scenarios Fury looked taller in the ring. I didn't like the attire that Wilder decided to wear, I like it when Wilder is wearing the more traditional mask, the one that covers his entire face. He looked like bane from Batman when he was in his entrance, I liked his song choice though Win by Jay Rock. Wilder could be just 6'6" flat, while I can maybe see 6'7.25" for Fury at a push. 6'8" is too high though. If we think back to Wilder’s pics with Melo, and then factor in Mickie’s post below, maybe we should have something like Wilder 6’6.25” and Fury 6’7.75” Rob? I've changed my mind after the weigh in and fight. I thought there was an inch between Wilder and Fury before. I think it's more than that now. I really think either Fury should be listed at closer to 6'8" or Wilder should be listed closer to 6'6". I don’t know about everyone else, but I found it pretty difficult to accurately gauge the difference in height during the fight. I could tell Fury was taller, but by what sort of margin exactly I wasn’t exaclty sure. Tyson is 6' 9" tall. We know him personally. He is mahoosif! Fury and Wilder at the presser today. Hopefully at the weigh in coming up, Wilder and Fury can have a barefoot stare down. And I hope Fury won't slouch or tip toe. It will be interesting to see what they each weigh in at. I'm thinking Fury might weigh in about 251 and Wilder 30 lbs lighter or so. It will be interesting the weigh in of the Wilder Fury fight. I suspect Fury will have the advantage if they go head to head but not by 2 inches. He may well do that tip toe thing again. When Fury stands decently, he can look very tall. When you have a low camera angle, it tends to make height differences look less (if distance from the camera is similar) and makes people closer to the camera look taller. The guy on the left background is Lawrence Okolie who is 6'5. Guys on the right i dont recognise, but they are most likely also shorter than Tyson. Duhon's picture is really a good example how pictures can lie. @Duhon - All about 7 foot plus or minus a couple inches, being that Fury is 6'9 ;) Just kidding, they are all tall, 6'6-6'8 range. Hard to tell exactly..
@Duhon, Tyson would probably be tallest of them all. It's just the camera angle foolin. The guy on the left, who seems to dwarf Tyson, is actually only 6'5. The difference isn't that large in equal footwear and Wilder is giving up more height in stance... But wow. It is possible Wilder is in boxing shoes in the photo with Kelvin Price, he could be at a footwear disadvantage there. I would believe up to a two inch difference between Joe Joyce and Fury but I think it is slightly less than that. I am not sure how tall Joyce is yet but he looks about 3.5 inches taller than Haye. I think Fury looked to have Joyce by at least a solid duece. It was hard to tell exactly due to Joyce's high hair, but Fury's eye line was mighty far above Joyce's. Even accounting for their subtle head tilts it seemed impossible to imagine a difference of less than 2" unless Joyce has an extremely tall forehead. I could see an argument for just over 2" or right around it. Like I said, height difference between Fury and Wilder is 1in or less. No need to downgrade others if Fury is a flat 6'7. Joyce could be just 1.5in shorter in that great photo. And I never believed Wlad was 2in shorter. I would accept 6'5.5 for Wlad and 6'7 for Fury. However, I think Fury is 6'7.25. If Wilder is 199cm, Fury is 200cm. If Wilder is 199,5cm, Fury is 200,5cm, If Wilder is 200cm, Fury is 201cm, and so on.. The chance Wlad is 195cm is very small. He is clearly taller than Lennox Lewis and Tony Thompson who is near about that. I cannot see Fury being under 202cm. The chance of Fury being 201cm is the same as him being 204cm. 202-203cm are the best guesses. @Mickie, Tyson is closer to the camera in your video, and he has footwear advantage there. In my video Tyson looks indeed taller at some point, but on the other hand, shooted from other side, they look very close. Im not saying Tyson and Wilder are the same height, they just look sometimes very close. It's obvious Tyson is the taller one, but i wouldn't be surprised if he's only 1cm taller. It's only 3 weeks now to the fight. Looking forward. 6'6", Joe Joyce to 6'5", and Wladimir to 6'4.75". Fury is an inch taller than Wilder when standing well - even in the video Robbe just posted you can see Fury standing taller than Wilder before he sort of "sinks" down to close the height gap and be eye to eye. Wilder and Fury looks pretty much the same in this video. For once, they might be wearing boxing shoes both there? I don't really see him being anything above 6'7". Joyce's hair makes it hard to judge, but it looks like Tyson might have him by 5 or 6 cm. Larry Bird is obviously the taller guy, he's an actual 6'9" guy. Interesting, Fury's eye line is a lot higher than Joyce, but the top of his head seems max 1.5 higher. Hard to be sure with all that hair Joyce has. This photo put's Fury in the 6'7 to 6'7.5 range, depending on how tall you think Joyce is. @Lanky Brendan Schaub is 6'4". Problems in identifying height arise when people that are compared with are underestimated. As for Fury I think he knows alot about height and is 6'8 3/4" out for bed. He probably loses a minimum of an inch throughout the day, he may drop to 6'7 1/2". Wilder is a solid 6'7", same as Vitali. He almost certainly isn't a lift wearer, because if he had been, he wouldn't have allowed Wladimir to match his size. In the ring there was about 2 and change between them. The debate isn't between 6'6" or 6'7" for Fury. It's whether he's closer to 6'7" or 6'8". He's visibly taller than Wilder is (in similar footwear) and some people even think he's 6'6.75" - 6'7" range. Giving it another close look I don't think his front foot is raised in that Joe Joyce pic, but admittedly it's a hard to tell for sure. One of the things that makes Tyson hard to estimate, I think more so than his tip toeing sometimes, is the fact that he often drops height in photos. If Tyson took up ballet, he might even reach 7ft on pointe. I think Tyson is tip toeing with both feet in that pic, just a bit more with the right foot. He looks close to his 6'9 claim in that shot, tip toeing of course. Great photo Mickie. Why does fury do that weird tip toe thing. It's not like he's short. Is it so that he always looks bigger than anyone else. He's a very tall guy but looks no taller than Wach. Klitschko said the same before their fight saying fury was not as tall as claimed. After his last fight fury was interviewed by a genuine 6'9" guy I believe and he was taller than fury. It's very tough to tell height difference in a boxing ring, Wlad had a very wide stance in there with Fury. If I had to guess their height difference looking at them during the fight I'd have said 2 inches. And I think in reality they are 1.75 inches apart in height (6'5.5 and 6'7.25), in Fury's favor of course. Wlad is the same height as Joshua, for all intents and purposes, you can hardly split them. Tyson does have an odd penchant for tip toeing. He even did it in the face off with Sefer who he towered over already. It strikes me more as clowning around, since it's in plain vision when you do that, rather than Wladimir who I think really is intending to get inside people's heads with stealthy lifts. Reece, are you sure Wach is barefoot in the picture with Wlad? Sometimes the guy who goes first on the scale has enough time to get his shoes back on while the other guy does not. Idk just asking. Pictures of him not standing well. And he stood better with Vitali when he was actually standing tall. Ustinov could be a weak 6 foot 7 that would make sense if he is giving a shoe height. And Wlad was wearing dresser shoes vs Fury probably with a little lift. Wlad and Wach were barefoot. Hughie Fury his cousin claims 6'6'' but I doubt this as well. I'd put 6'5'' possibly but no more. Hughie called out Wlad for wearing lifts at the Fury Klitschko weigh in and was probably right about this. However Hughie didn't look much taller than his opponent Pulev at the weigh in of their fight tonight once you take into account his hair. I wonder if these athletes have ever been properly measured minus footwear. Their given heights seem to be accurate if they are wearing boots or something. Again claimed 6’9” on Joe Rogan’s Podcast this week. Said Wilder is 6’7”. I agree that Fury was taller than Ustinov. I don't know enough about Ustinov to peg an exact height, but he certainly appears not as tall as billed in that one Helenius picture. To me Wach looks taller than Fury compared to Wlad. Wlad's eyeline hits at Fury's upper nose, and at Wach's lower nose. Both mens forehead is about the same size. Looks like Wach is a good 1cm taller than Fury, according to those pics. @Reece - I think you might be right about that. Fury probably would be the more likely to measure some mm taller but we're talking about 1 cm or less. They're almost identical. I think Wach is a little shorter than Fury barefoot . He looked shorter next to Wlad than did Fury. We just have to wait for the official weigh in Fury vs Wilder to see the real deal. In the latest events Tyson has been tiptoeing, with footwear advantage. Loa take a good look at Fury with Wilder, there are tons of photos and video of them face to face now. Fury is likely in the 6'7 to 6'7.5 range, I think many of us agree on that. Also, I have always believed Klitschko is about 6'5.5. He got a bad wrap on here as a lift wearer, but that was before we all figured out Fury was much shorter than listed. He may have worn lifts at times but, in lieu of the Fury height revelation, many of the Fury-Klit photos make more sense now. Lol, Wladimir is a lift wearer though. In the ring, Tyson had him by 2 and change. These are perhaps the best pics to judge Wlad vs Tyson height difference. We cant see their footwear, but it's possible both men are wearing only socks there. Tyson Fury is 6'7 1/2, while Wilder is 6'7. He cannot be taller than 6'8. What makes him appear to be taller is his arm length - 85" wingspan, which is longer than other HW's his size and also his posture (his shoulders are higher than other HW's his size). The only photo I ever saw where Fury and Wlad looked 2.25 inches apart was the one out in the grass/stadium where Wlad has a noticeably wider stance and is holding 50 lbs in championship belts lol. Yeah I think Fury has Wladimir by a more than 2", and has Wilder by a solid inch. Just like Rob has them listed. Fury is no less than 2 inches taller than Wlad in my opinion maybe even a little more. Wlad is a known lift wearer. So him being shorter than his listing wouldn’t surprise me one but. Actually, I think Wlad needs an upgrade to 6'5.5. Wilder is 6'6.5 and Fury is 6'7.25 - as I see it right now anyway. I never bought into that there was a full 2 inches between Fury and Wlad, I think slightly less than 2 inches is the real difference. Fury in my opinion is a inch taller than Wilder with a good chance of a inch and a half. Actually Christian, I believe he was listed at 6'8" first. Then 6'7" then 6'7.25" then 6'7.5". If he's only 6'7" then Wilder and Wladimir near downgrades too. He edges out Wilder by a cm or two, maybe three, but no where near two inches, i’d Believe 202cm for Fury. Fury was initially listed 6'7" when he was added here. There was no reason for Rob to upgrade him a half inch, IMO. Often listed 6ft8.75 which I wonder if it's a shoe height and then 6ft7.75 barefoot. That'd explain the 6ft9 listings, just under it in shoes and then claims it. Both of their shoes look fairly low heeled and normal to me. Neither of their shoes look exceptionally low heeled. Personally at the moment I think there's a solid 2.5 to 3 cm between them, since all that I saw at these press conferences. I will admit there's a case for the difference being only 2 cm. I don't think anything less than that is believable after you see the staredown and also when you consider how Wilder himself calls Fury 6'9". Fury had surely shoe advantage there. Wilder's shoes were flat all the way, Tyson's shoes had seemingly visible heels. Wilder (in sneakers) was also slightly taller Than Tyson in his boxing shoes. Im still not buying Fury being 1in taller than Wilder. Not until i see both men barefoot, face to face. P.S. Fury's tiptoeing in staredowns is really annoying. Wish he could stand still. It would be much easier to judge their height difference. I think Fury is at least a inch taller and Wilder isn’t less than 6 foot 6 1/2 imo. Once again, Tyson has clearly bigger heels in his dress shoes than Wilder has in his flat shoes. The real height difference is not so big between these men. I wish Tyson could perform these events with flat shoes, like Wilder. But obviously he wants to look bigger than Wilder. So, waiting for the final weigh in.. In light of the NY presser, it seems there is most likely a 2cm (3/4) height advantage for Fury. Remember, we must take into account that Fury constantly tip-toes during face-offs and my have a slight footwear advantage on Wilder who seems to be wearing Vans type shoes. Also, one should draw their conclusions on the height difference based on watching as much video/pictures as possible. Right now, I say 6'6.5 for Wilder and 6'7.25 for Fury. My opinion may again change, I am looking forward to seeing them both in their socks at the weigh-in! Fury has though bigger forehead, so they match up very close. I guess we'll have to waite for the final weigh in to see the real deal. Actually we haven't seen a single good photo/video of these men with equal footwear. Hopefully both men are in socks in the final staredown. Wlad vs Joshua weigh in was quite useless, cause Wlad wore sneakers, and Joshua only socks. Wlad was noticeable taller there, obviously. What do you think the difference is? Assuming same footwear there could be 3cm between them, arguably Tyson nearer 6ft 8 if Wilder is 6ft 6.5. In 2016 when they met in the ring wilder was wearing boxing shoes which were flat and fury wasn’t and fury was taller by a bit but it was pretty similar. In 2018 when they met in the ring fury was wearing flat shoes and wilder wasn’t and wilde looked way taller so logically wilder is taller . And In the 2 press conferences both of them are not wearing boxing shoes and we still see wilder looking taller and fury shorter. We see fury is annoyed so that’s why he stands on his tip toes. Mickie and Movieguy12: It was not possible to split them yesterday. Sometimes Fury seemed slightly taller, sometimes Wilder seemed slightly taller. They are within a .5 inch and the jury is still out as to who is taller. @movieguy12, i dont think so. I believe Fury had shoe advatage also, he was wearing dress shoes with 3cm heels. Wilder was wearing some kind of gold colored shoes, to me they looked quite flat. Im not sure though. Wilder's 6'6.25" and Tyson's 6'6.75"
It's completely over, the idea that Fury and Wilder are the same height. You'd have to straight up be in denial to think that now. Fury is roughly an inch taller. Sometimes the difference looks less than that and sometimes more, but in equal footwear and comparable posture it's somewhere between 2 and 3 cm. I can’t think of another person whose height is more difficult to accurately nail down. Initially I thought he was a weak 6’8”, then after the stairdown with Wilder in Fury’s last fight, I started to think maybe Fury is basically a flat 6’7”, now after the press conference I’m back to thinking he’s closer to 6’8” than 6’7”. They are not the same height, Fury is taller. At press conference today fury looked taller than wilder. Maybe not 2 inches but a good inch plus. Yup, as expected, he looks identical in height to Wilder in the new face off video. Rob, will you downgrade Fury if a preponderance of photographic evidence indicates he is the same height as Wilder? No offence folks, but i have posted this pic below over an year ago. Really, Tyson, with his dress shoes isn't much taller than Wilder, with his boxing shoes. This pic was pretty much ignored when i posted it, by some Fury fans, saying "no, Tyson was 2in taller in the ring". So, that pic turned out to be pretty damn accurate. Wilder must be a legit 6'7. Otherwise it doesn't make any sense. If Wilder is under 6'7, so is Tyson and Vitali also. So, Tyson was measured 6'7 as amateur. Big question is, has he gained height after that. If Wilder is as listed, looks that Tyson is still the same, 6'7. If you look at the video i posted, Wilder actually looks a bit taller than Tyson, before Tyson starts to "kiss" him. Both men standing relaxed here. Seems as listed has slight edge on deontay in stare down with footwear disad. 6 9 seems laughable id say if anything knock half an inch off both. Boxers wear shoes and like bballers they measure with them on and often bs it altogether. The important question is who is the best heavy weight furthermore why not fight joshua first? Fury was a little taller than Alexander Ustinov (202 cm listed) and a little shorter than David Price (has claimed 6'8" but usually claims 6'9"). Wladimir who called him out on his height claim thought he was about the same height as Wach (who is reportedly 202 cm) other boxers have believed his 6'9" claim (Steve Cunningham claimed he was 6'3" and Fury was 6'9"). I think if Fury was significantly than 202 cm Wladimir would've said so and guys like Steve Cunningham wouldn't have believed the 6'9". I think the 6'8.75" listing he's had recently is his height in shoes. But the stare down with Wilder at a footwear disadvantages makes over 202 cm seem impossible (unless Wilder was pulling a Klitschko, which I wouldn't think probable) thus I think Rob actually has him listed perfectly. I think the one with Wilder wasn't so much to look taller as to go in for the mock kiss lol. If Tyson was truly height obsessed I don't think he'd stand with such poor posture, but he does pull the tip toe move during face offs at times. It is normal for tall men to tip toe at times. Wlad could wear lifts to make him look more physically imposing. Fury is minimum 6-7.5 in my opinion. What is this tiptoe thing with Fury? Why is he doing it? Why would Wlad wear lifts? I don't know why a man that size wears lifts. However I think it's pretty certain he does on occasion. The most famous example is the Fury Wlad weigh in where Wlad edged out Fury in the stare off. I don't buy Fury as 6'9'' but he's no shorter than 6'7'' minimum and taller than Wlad for certain. The Fury camp also reckon the scales were fixed so that Fury's weight was less than it should be. I'm not sure about this though. Chuck Wepner the 'Real Rocky' claims Wlad is 6'4'' although I don't know if this is the case. Wlad is a big man but mind games were part of his act. @Viper - Wlad wears lifts to appear taller in faceoffs against opponents, he probably perceived it as a psychological advantage of some sort. That's why he appeared even in height with Fury at the weigh in but looked 6 to 7 cm shorter in the ring. Also why Wladimir at times made David Haye look like he was struggling with 6-0 when he's obviously more 6-1 to 6-2 range. @Mickie, Wilder is not standing prperly in that picture you posted. He is leaning forward on Tyson, and loosing height there. Difference was not so big in reality. Secondly, Wilder was wearing flat trainers in the newest staredown. They were eye to eye. That would mean Tyson is only about 1cm taller than Wilder. But like you said, we'll see the true difference in the weigh in. About Wlad, it's true you never know if he's wearing lift's or not. He looks huge with Pianeta in deed. Very possible he has boosted his shoes once again there. So I reckon Fury with equal shoes is 0.5in taller. @ Robbe - Wladimir is a known lift wearer. Personally right now I think Pianetta is 6'4", Fury 6'7.5", and Wilder 6'6.5"
The true difference we're going to see when these two face off is about half way between these two photos. Probably about an inch in favor of Fury, just as Rob has it. Him and Wilder were eye to eye when they squared up in the ring. Wow. The commentator Ronald McIntosh who interviewed Fury and Wilder last night on BT Sport looked taller than either. Apparently he's 6'9'' plus. When Wilder came in the ring after the past fight he looked as tall or a fraction taller than Fury. When Fury came in the ring after Wilder's fight, he looked about 2" taller than Deontay when standing straight... I guess boxing shoes must give very little in height. Wilder was TALLER than Fury in ring tonight. Wild likely with a footwear advantage but Fury is NOT 6'9 that is for sure. Just had a brief look at Fury next to Wilder in ring after tonight's fight. Fury did not look 2 inches taller than 6'7'' Wilder. Hardly any difference but perhaps it was a bad angle to judge. @Mickie, Tyson's opponent, Francesco Pianeta, is nowhere near 6'5, just look at him next to Wlad. Some of the estimates here are really ridiculous, 6'6 ? Really ?? This guy is gigantic, please look at his pics next to real 6'4.5 Rico Verhoeven or even next to Wlad..
What would a 6'6 or 6'7 Fury make Wlad ? 6'4 ? What an utter joke..
Open your eyes people, he has an awful posture in most shots, and almost never stand straight but when he does he looks really tall ( 6'8 range imo ).. He had 2.5 to 3 inches on Wlad on several pics when they were standing straight next to eachother and that's what he looked in boxing shoes in the ring..
Dillian Whyte is not 6'3.5 range, he is around 6'2, maybe 6'2.5. Hughie Fury is 6'5. He was 2in taller than 6'3 Parker at their staredown. Lucas Browne is around 6'3.5. Tyson Fury is shorter than David Price who is 6'8. Miko I believe the consensus on here is that Parker is 6'3 and Whyte is a cm or 2 under that. I think that would make Browne closer to 6'4 flat. No rule actually says that you have to give your height at a low. He might be close 6 foot 9 or 6 foot 9 fresh out of bed and defo in shoes. That could be where the claim comes from. I find under 202cm hard to believe. That would make Hughie Fury sub 6 foot 5 and Wlad sub 6 foot 5 if Fury is 6 foot 7 flat. Looks massive at times. There is a picture of him with Ricky Hatton and he looks gigantic. David Price does look taller in photos together although Price is given as 6'8'' and Fury 6'9''. Has Fury ever been measured properly or is the 6'9'' an estimate? Rob have you considered adding the Australian Boxer Lucas Browne? He's had 6'4 and 6'5 bills. I personally think he's smack bang in the middle at 6'4.5. He was about an inch taller and stacked up a little better than Joseph Parker did to Dillian Whyte who himself is 6'3.5 range. ROB what would you say makes a massive strong 6'7 guy feel the need to inflate his height ? Maybe he was measured 6ft 9 in footwear...it's not entirely impossible, but barefoot I can't see it. People who are tall can still inflate, to seem even more impressive to people. He can look 6'6" range when dropping height at times. Other times he can look 6'8"-ish when standing well. Rarely looks like a guy who would measure 6'9" barefoot in the evening though - the few times he has it's only been next to people who may have had their heights over billed (Seferi, Lucas Browne, etc). Fury is a weird one, he can look anywhere from a weak 6'6 to a very solid 6'7.5 at times. It's clear as day though that he's never been anywhere near 6'9 unless he measured on his tiptoes. It wouldn't be surprising if Fury was a guy who did shrink as much as 3 cm in a day. With his build, I'd figure he'd shrink an inch at least. Out of bed height 205 cm / almost 6'9 , long spine = 6'9" claim . The Wach and Fury pictures seem inconclusive to me. They have different postures in this photo and we can't see their footware. Their shoulders looked the same height. All you can take from it imo is that they are quite close in height. Wach may be slightly taller in the picture, but it's not overly convincing that he'd actually measure any taller. I think he is still 202cm at least even at night before bed. Him waking up at 204cm or a little above and dropping to 202cm. I don’t trust anything less. In my opinion Wach does look a little taller than Gary in that picture you poster. The only way I see him dropping below is after a heavy heavy training session late on in the night. Tyson is for sure taller than 202,5cm out of bed. He shrinks easily a good inch during the day. I would say he is 204cm out of bed, and 201cm at lowest. Im 187cm out of bed, and 185cm late in the evening. Tyson shrinks for sure more than i do during the day. Fury looks similar he does not have hair and has worse posture yet he looks so similar in that picture. Fury bigger next to Wlad when standing better with good posture. And Kiwi Bloke why Fury so low. The chances of him waking up at less than 6 foot 8 are next to nothing. I would be confident he would still be at least over 6 foot 7 late on. He looks level if not taller than Wach in that photo IMO, when taking into account Wachs hair and Tyson being slightly further away from the camera favors Wach. What are the chances of Fury waking up at 205-206cm hence the 6 foot 9 claim?